Few American DJ products have more timeless appeal than the company’s original Vertigo and Aggressor effects. 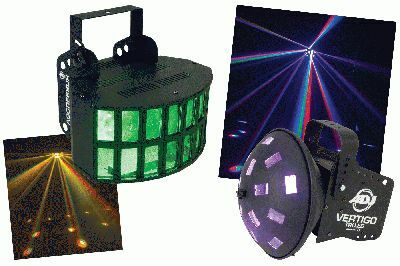 Rife with exciting multi-colored beams, these sound-activated plug-n-play fixtures have been top-selling ADJ mainstays for years due to their extreme popularity with mobile DJs and club lighting users alike. Now, these much-loved effects have gone LED by a factor of three with the he introduction of the Vertigo TRI LED and Aggressor TRI LED. Featuring American DJ’s exclusive Tri-Color LED Technology, these brand-new versions allow you to enjoy all the great advantages of LEDs and still experience the eye-popping rainbow of different-colored beams that made the originals achieve legendary status in the first place. The Vertigo TRI LED and Aggressor TRI LED each feature a pair of 9W LED lamps that are actually comprised of 3 different-color 1W LEDs: a red, a green and a blue. This revolutionary 3-in-1 design allows color-mixing to be done inside each individual lamp, creating a whole spectrum of color possibilities, unlike traditional LED effects with single-color lamps that can produce only one-color beams. Each Vertigo and Aggressor TRI LED lamp is capable of producing 7 colors: yellow, purple, cyan, red, green, blue and white. Tri-Color LED Technology also results in more vibrant, even-toned mixed colors. The results are beautiful, sharp, vibrant multi-color beams literally at the flick of a switch. The Vertigo TRI LED features 32 beams of multi-color light that rotate and crisscross back and forth to the beat of the music, covering a wide area. Slightly more compact than the original model, the highly mobile Vertigo TRI LED measures 13.5”L x 11.5”W x 10.75”H and weighs 8 lbs. The Aggressor TRI LED also boasts 32 multi-color beams that dance and strobe to the music. Substantially smaller and lighter than the original model, the new version measures 13”L x 12.5”W x 12.5”H and weighs just 13 lbs. Both of these new plug-n-play TRI LED effects are incredibly easy to use. They are sound-activated via internal microphones and run according to their own exciting built-in scenes and chases, so no controller is required. Like all LED effects, these two fixtures operate at an extremely cool temperature, so they will run all night without ever needing to pause for duty cycles. They provide other LED benefits as well, including long-life lamps that are rated at 100,000 hours each. Extremely energy-efficient, the Vertigo TRI LED and Aggressor TRI LED draw only 32W and 30W of electricity, respectively � representing a huge power-saving advantage over the original Vertigo and Aggressor, which required 300W halogen lamps. The Vertigo TRI LED carries a suggested retail price of $179.95. The Aggressor TRI LED carries a suggested retail price of $219.95 (same as the original halogen Aggressor!). Click here to see the Vertigo TRI LED in action! Click here to see the Aggressor TRI LED in action!